This time last week I dropped off my 15-year old daughter at school for her French exchange trip. In the dark, lamp-lit morning (4:30am), seeing her onto the school coach felt like a surreal experience. In a haze of orange street-light, I was sending off into the unknown, to stay with a family I'd never met before. Instinctively, I didn't want to let her go, even though my head was telling me this was a good opportunity for her. My daughter at ease with her new independence! On the quiet drive home, I gave myself a stern pep talk. As a good parent, I needed to allow my daughter her independence and the freedom to try out new experiences. The word march was a misnomer. It was more of a gentle stroll on a mild spring day. A great tide of humanity rolling through the famous streets of London - Park Lane, Piccadilly, Whitehall; everyone chanting and waving placards. 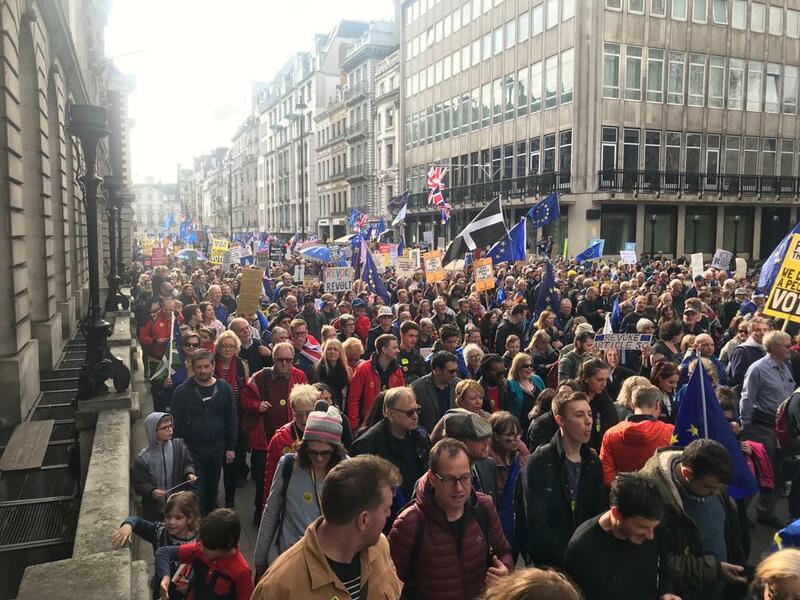 This was the People's March, a historic protest against Brexit, with hundreds of thousands voicing their call for a second public vote. I woke up on Saturday morning undecided as to whether I should go. (We're currently planning a house renovation with an endless 'to do' list.) But then I watched a clip of Anna Soubry on Channel 4 News talking about the death threats she's received for speaking her mind on Brexit - vile letters posted to her home address. Soubry's closing words were: "Get on that march and show them we've had enough." We could live here quite happily for another year or so without doing anything, but we're under pressure to get the heavy lifting out the way before my daughter takes her GCSEs next summer. Just when you thought An Author's Notebook might have died and gone to blog heaven... here I am! The reason for my absence has been book-related: I've spent January finishing my third novel. I'm nearly there (New Year's resolution - tick!) although I'm still tinkering around the edges. I actually finished writing the book over a year ago, but have spent all this time chiselling away at it, refining sentences and teasing out themes. Most usefully, I've been addressing feedback from a small group of readers - most of them writers themselves. I've been so lucky with the people I have met through my CBC creative writing course, as well as a few supporters closer to home. Christmas is an elaborate production. The sheer brilliance of it is that everyone collaborates in one way or another - whether that's buying presents, sending cards, or perpetuating the magic of Santa. The festival is one massive, co-ordinated effort across the nation and most of us opt in without even questioning it. The results are spectacular: from the gorgeous lights illuminating our town centres to crazy knitted jumpers, Secret Santa, fairs, parties and the decorated trees adorning our homes. My first ever Christmas wreath! As each year passes, I get more practised at keeping my end up. I now have processes in place (start the cards early; book online shopping slots in November) to make life easier. I know what's expected and I deliver. It helps that it's the same show every year because - let's be honest - I'm not much of an innovator. I follow the time-honoured plan and streamline efficiencies where I can. A friend and I were discussing what I should buy her little girl for Christmas. We hit upon Lego. "Friends Lego, the pink stuff?" I clarified nervously. She grimaced apologetically: "Yes, I think she'd like it. It would make a change from all her brother's kits." We both experienced that twitchy, self-correcting thought - in this 'woke' world of new feminism, should we really be buying our girls pink Lego? Are pink roses just for girls? The fact is my daughter enjoyed her pink Lego back in the day and I suspect this little girl would too. I'm guessing the 'Friends-themed' Lego range wouldn't have expanded as quickly as it has, if it didn't sell. The treehouses, camper vans and art studios, all decked out in pastel shades, are clearly designed to appeal to a feminine sensibility. Heck, I probably would have loved Friends Lego too as a child, had it been around then.